Experience amazing bush sounds as you are taken on a journey around Australia. This album of 52 separate recordings, blended together as a continuous sequence, provides an interesting composition of the author's experiences with sound recording on his numerous trips to all parts of Australia. This CD captures the timeless ambience of Australia as you move from rainforest to desert, mangroves to mallee and mountains to the sea. Hear the wonderful songs of birds in remote places, listen to the choruses of frogs in wetland habitats and marvel at the incredible calls of possums, dingoes and goannas. Tropical thunderstorms, the bubbling Artesian Basin bores, campfires and crashing waves interweave with the rustic nostalgia of windmills and steam trains in this amazing soundscape. 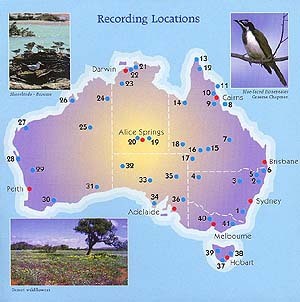 The recordings are taken in natural surroundings and the CD is compiled as a continuous sound track. The sounds of the different scenarios give the feeling that you are actually there experiencing the many and varied noises of the Australian bush. The tracks merge into each other and there are no obvious fades. This CD has no music or spoken commentary. For those interested to know the track title and the location of each recording, the album is indexed. 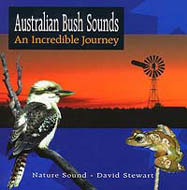 Birds Australia, the largest bird organisation in the country, endorses and recommends this CD to people interested in hearing a selection of sound tracks of Australia's amazing bush sounds.